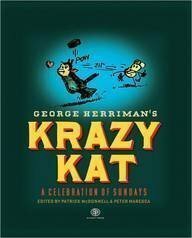 Just in time for the 100th anniversary of George Herriman’s world-famous Krazy Kat comic strip, Sunday Press Books is re-releasing Krazy Kat: A Celebration of Sundays in hardcover. “A Centennial Celebration! Finally, Krazy Kat as it was meant to be seen. From the publishers of the celebrated and much-awarded Little Nemo in Slumberland: So Many Splendid Sundays! deluxe oversized reprint edition, come 135 full-size Sunday pages from 1916-1944 — plus dozens more early comics from George Herriman. It’s the eternal triangle of the comics — Kat, Mouse, and Pupp, along with the catalytic brick. Here are their glorious, poignant, and hilarious stories from the genius of George Herriman, reprinted for the first time in their original size and colors. Included in the 14 x 17-inch collection is a sampling of all Herriman’s creations for the Sunday newspaper comics from 1901-1906: Professor Otto, The Two Jackies, Major Ozone, and more, many of which have never been reprinted before. Now, 100 years after Ignatz tossed his first brick, step back in time to delight in the timeless tales of America’s great comic strip artist and his greatest creation, Krazy Kat.” Check it out on Amazon.